We conduct our business ethically and with integrity. We live by our values and governance principles when engaging with our customers, suppliers, employees and other stakeholders. We also care about the people who work with us. We empower them to have an impact, to innovate, to grow and to live meaningful lives. We show our commitment to them by offering them an inclusive, safe and inspiring workplace that respects them as individuals. And to ensure our products and services meet our customersâ&#x20AC;&#x2122; demands and expectations, we have introduced structural initiatives to engage with them and gather feedback, including co-creation, design thinking, forums, and more. secure and comply with strict health and safety standards. We conduct marketing responsibly and respectfully and nurture a transparent relationship with our customers. Our customers are at the center of everything we do. In an increasingly digital world, we want to remain relevant to them by offering new digital solutions and great experiences that are personalized and authentic. We want our customers to feel confident and able to rely on an expert digital provider. Our corporate culture and values define how we work. 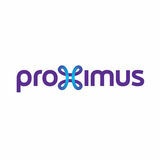 Proximus is imagining a future that will be positive for everyone. Our focus is not only on what we do, but how we do it. How we engage with people. How we conduct business.